Confirms the minutes of the meeting of the Audit, Risk and Finance Subcommittee, held on 14 August 2018, as a true and correct record. Refers all powers of the Audit Risk and Finance Committee relating to the adoption of the final Annual Report 2017/18 to Council provided that there are no material changes to the draft resulting from the audit. Considers all matters relating to the adoption of the final Annual Report 2017/18 directly if there are no material changes to the draft resulting from the audit. Receives the report Carry Forwards 2017/18 (R9558) and its attachment (A2042278). Notes that the total capital budget (including staff costs but excluding consolidations and vested assets) will be adjusted by these resolutions to a total of $41,868,000. Receives the report Draft Internal Audit Charter - Review September 2018 (R9637) and its attachment (A2026584). Approves the Draft Internal Audit Charter – Review September 2018 (A2026584). Receives the report Draft Annual Internal Audit Plan - 30 June 2019 (R9657) and its attachment (A2026190). Approves the Draft Annual Internal Audit Plan to 30 June 2019 (A2026190). On Tuesday 14 August 2018, commencing at 9.04a.m. In Attendance: Councillors G Noonan, M Rutledge, S Walker, Chief Executive (P Dougherty), Group Manager Infrastructure (A Louverdis), Group Manager Community Services (R Ball), Group Manager Corporate Services (N Harrison), Manager Communications (P Shattock), Manager Governance and Support Services (M Birch), Team Leader Governance (R Byrne) and Governance Adviser (R Terry). Document number M3580, agenda pages 6 - 9 refer. Confirms the minutes of the meeting of the Audit, Risk and Finance Subcommittee, held on 26 June 2018, as a true and correct record. The Chair noted that the Council was obtaining legal advice for the Greenmeadows project and the Chief Executive would be conducting internal and external reviews. The Terms of Reference for the reviews would be signed off by the Mayor and Chair of Audit, Risk and Finance, Mr John Peters. It was noted that an external review was appropriate to determine how Council could improve their processes moving forward. Confidence was expressed in the Chief Executive. Clarification of the committee’s responsibilities and confirmation of governance oversight of the reviews and reports was requested. Document number R9523, agenda pages 10 - 26 refer. Risk and Procurement Analyst, Steve Vaughan presented the report. He advised the Council had completed a test scenario for major disruptions on 27 July 2018 and observers notes were being worked through. He noted that internal communications and clarification of roles would be an area of focus. · The risk rating was spread across all projects, balancing out ratings so that Council may not be aware of any individual issues. It was noted that with some capital projects significantly behind schedule, performance and delivery of projects resolved in the Long Term Plan, 2018 – 28 could be compromised. In response, it was advised that there would be quarterly performance reporting to committees. It would include a section on risks, current issues and activity budgets so that each committee could review any potential risk to Council. Any projects over $1million would still also be reported to Audit, Risk and Finance for review. These changes would be introduced from the September quarter. Mr Murray also requested a separate report to cover Council’s risk management framework. This would include the processes for risk identification and management, allocation of risk to the correct person, and improvement of controls to ensure they are effective. The meeting was adjourned at 9.25am and reconvened at 9.32am. Receives the report Quarterly Key Risks Report - Quarter 2 Calendar 2018 (R9523) and its attachment Key Organisational Risks Report Quarter 2 Calendar 2018 (A2011772). Requests that the quarterly key risk report be revised so it is fit for the Audit, Risk and Finance Subcommittee’s purpose, reflecting the feedback and discussion at the current meeting. Document number R9533, agenda pages 27 - 30 refer. Internal Audit Analyst, Lynn Anderson presented the report. Ms Anderson said that there had been an update to the contract renewals item on page 29; contract payments had now been added to an electronic purchase order system. Work was being completed to bring historic contracts in to the document management system. This work was on-going and additional resources may be required. The audit reports for monitoring and management of contractor performance were currently being drafted and would be presented to the Senior Leadership Team when complete. If any high-risk findings were identified during the audit, the Chair would be notified. Group Manager Corporate Services, Nikki Harrison provided an update on the annual audit plan, noting a new audit programme would be presented at the next meeting in September after discussions with Audit New Zealand and the Chair. Receives the report Internal Audit - Quarterly Progress Report to 30 June 2018 (R9533) and its attachment (A2008536). Document number R9534, agenda pages 31 - 34 refer. There was discussion around the significant risk exposures. Ms Anderson noted that the new contract templates had improved the quality of the contracts and would assist to reduce risk. Ms Anderson said that work was being done to prevent water contamination and sabotage of waterways, including international research, controls and filters. There had been a duplication of lines for any at-risk areas at the water treatment plant and frequent testing and recording of data. The new contracts template had decreased risk going forward, but it was noted that a number of contracts in the old template format were still in the system. It was decided that the Chair of each committee would have a meeting with the relevant Group Manager to understand any residual risk from older contracts. In response to a question, Ms Anderson noted that the control environment item at 3.2 was still current and advice was being sought from the risk analyst to confirm the current risk rating. Receives the report Internal Audit - Summary of New or Outstanding Significant Risk Exposures and Control Issues to 30 June 2018 (R9534) and its attachment (A2006732). Document number R9200, agenda pages 35 - 45 refer. Senior Accountant, Tracey Hughes and Manager Capital Projects, Shane Davies presented the report. Mr Davies advised there had been an underspend on capital projects due to construction delays. 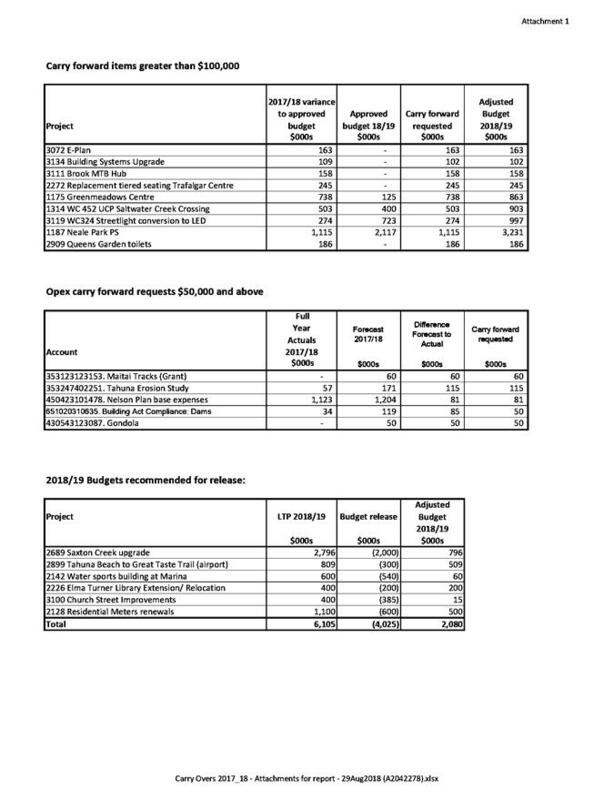 A break-down of the underspend, by project, was requested, including timeframes for staging and completion. The committee expressed its concern regarding the capital underspend only becoming apparent at this stage. It was agreed that the Chairs would be informed of any project issues at their weekly meetings with the Group Manager and any issues would be further reported to the Mayor. Group Manager Corporate Services, Nikki Harrison noted an underspend of $700,000 within the IT space on three projects. Further information would be included in the carry forward report at the next meeting. Attendance: Her Worship the Mayor Reese left the meeting at 12.08p.m and returned to the meeting at 12.15p.m. Receives the report Corporate Report to 31 May 2018 (R9200) and its attachments (A2023685 and A2025408). Document number R9217, agenda pages 46 - 60 refer. Health and Safety Adviser, Malcolm Hughes presented the report. Mr Hughes noted a correction on page 47. Item 5.3 should read that ‘during this reporting period, no councillors participated in a safe work observation’. · the possibility of driver training or withdrawing access to vehicles for repeat offenders of speeding. Receives the report Health, Safety and Wellbeing Performance Report (R9217) and its attachment (A2011373). Document number R9579, agenda pages 61 - 73 refer. Manager Governance and Support Services, Mary Birch presented the report, noting this was a stand-alone policy and would not need to be referenced in Standing Orders. Receives the report Draft Governance Members' Protected Disclosure Policy (R9579) and its attachment (A2013157). 1.1 To provide a copy of the draft Annual Report 2017/18. 2.1 The draft Annual Report for the 2017/18 financial year has been prepared and is provided as Attachment 1, for information. It is in the process of being audited and there are likely to be some changes as a result of the audit process. 4.1 The purpose of the Annual Report is to compare Council’s actual performance against the targets as set out in year three of the Long Term Plan 2015-25 and Annual Plan 2017/18. It also provides accountability to the Nelson community for the decisions made throughout the year. 5.1 The attached draft Annual Report 2017/18 is intended to provide Council with information officers have to date. This is not the final Annual Report for the year, and has not yet been audited. It is likely to require modification through the auditing process. Some sections are still to be completed. 5.2 As the final Annual Report 2017/18 is required to be adopted by Council within four months of the end of the financial year, it is proposed that it be brought to be brought to Council for adoption at Council’s 25 October meeting. Given the time constraints, it is recommended that the Annual Report be presented directly to Council, rather than to the Audit, Risk and Finance Subcommittee first. 5.3 However, if there are material changes to the draft Annual Report resulting from the audit, these will be brought to a specially convened meeting of the Audit Risk and Finance subcommittee prior to the Council meeting for information. 5.4 The surplus before revaluation is $11.4 million more than budgeted. There are multiple reasons for this variance which will be detailed in the final Annual Report. 5.5 The following items are better than budgeted – Development Contributions ($1.2 million) and salaries ($0.7 million). The following items are worse than budgeted – Vested assets ($1.1 million), storm events ($0.8 million), other un-programmed maintenance ($0.6 million), unbudgeted impairments, losses on disposal, abandoned assets ($1.7 million) and derivatives revaluation ($0.8 million). 6.1 This report is provided for information. The Audit Risk and Finance Subcommittee has the option to receive this report and attachment or not to receive this report and attachment. It is recommended that the Subcommittee receives this report and notes the final Annual Report 2017/18, with any changes resulting from the audit process, will be presented directly to Council before the end of October. 7.1 An Annual Report must be completed to comply with section 98 of the Local Government Act 2002. 7.2 The purpose of this report is to provide the Committee with a draft of the Annual Report 2017/18. A final, audited report will be provided to Council for adoption on 25 October 2018. The Annual Report 2017/18 is a requirement of the Local Government Act 2002 and fits the purpose of local government by providing information about Council’s performance during 2017/18, thereby promoting accountability. The Annual Report 2017/18 contributes to the community outcomes by measuring performance across the full range of Council activities. The content of the Annual Report is prescribed by statute so there is a very low risk that it will not achieve the required outcome. There is a risk that Council would not be able to adopt the Annual Report 2017/18 by 31 October and meet the requirements under the Local Government Act 2002 if the final Annual Report is presented to the Audit Risk and Finance Subcommittee first, rather than going directly to Council. Preparation and publication of the Annual Report can be achieved within funding allocated in the Annual Plan. The decision to receive this report is of low significance. The final audited Annual Report will be provided to Council for adoption in October. There will be a summary Annual Report available following adoption of the final audited Annual Report and this will also be made available to the public. The Audit Risk and Finance Subcommittee has the following delegations to consider the Annual Report 2017/18. 1.1 To approve carry forward of unspent budget to the new financial year. 2.1 Invoice processing is complete for the 2017/18 financial year and officers have reviewed project expenditure in order to identify savings and consider whether unspent budget is still required. 4.1 The capital programme for 2017/18, as agreed in the Annual Plan 2017/18, totalled $55.7 million, including staff costs of $2.2 million and excluding Nelson Regional Sewerage Business Unit (NRSBU). All figures quoted in this report do not include vested assets. 4.2 The addition of 2016/17 carry forwards, and other resolutions of Council over the 2017/18 year adjusted the total capital budget to $56.2 million. 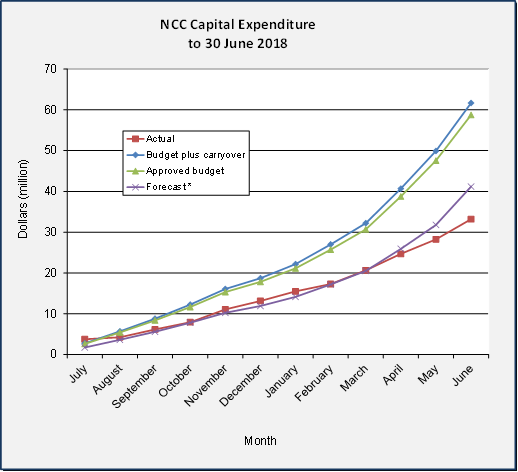 4.3 The 2017/18 capital budgets were reforecast in January 2018 with a view to what could realistically be achieved in the remainder of the financial year, to inform the Long Term Plan process. The total capital budget was reforecast to $39.4 million. Decisions made subsequent to that forecast brought the budget to $41 million. 4.4 Total capital expenditure for the 2017/18 year was $32.4 million, $8.6 million less than forecast. Of this, $945,000 has been identified as savings. 4.6 Carry forwards for operating budgets are presented for the approval of the sub-committee and are requested to complete programmed work. 4.7 Once the 2017/18 year was closed for invoice processing, officers collated data relating to the projects undertaken during the year, identifying variances against the reforecast. Project managers were asked to identify which variances represented savings, and where they wished to carry forward budget into 2018/19 they were asked to support their request. The Senior Leadership Team have reviewed the resulting information to ensure that the requested carry forward is justified. 4.8 The Corporate report presented at the 14 August 2018 subcommittee meeting indicated an under-spend of $8.1 million against 2017/18 projections. After revisions only $5 million carry forward has been requested. The difference is essentially phasing changes on multi-year projects – for projects where there is sufficient budget in 2018/19, the 2017/18 underspend will need to be added down the line (2019/20 or even later) to maintain the total project budget. 5.1 Officers identified $945,000 of net savings in capital expenditure against forecast. This will have a positive impact on interest, depreciation and debt levels, in excess of that already identified in the 2018/19 annual plan. 5.3 For renewals budgets and multi-year projects, any spend over the 2017/18 projection is considered a timing variance and is offset against the 2018/19 budget, thereby reducing it in the amount of $1.1 million. 5.4 Officers have requested that $5 million be carried forward and a total of $1.1 million deducted from 2018/19. In addition, $4.0 million of 2018/19 budget should also be deducted as project delays indicate that the budget will not be spent in this financial year. This revises the total capital programme for 2018/19 to $41.9 million (excluding vested assets and NRSBU but including staff time), equivalent to the budget established through the long term plan of $42.1 million. Interest, depreciation, and debt relating the requested carry forward amount was already built into year one of the 2018/28 Long Term Plan. 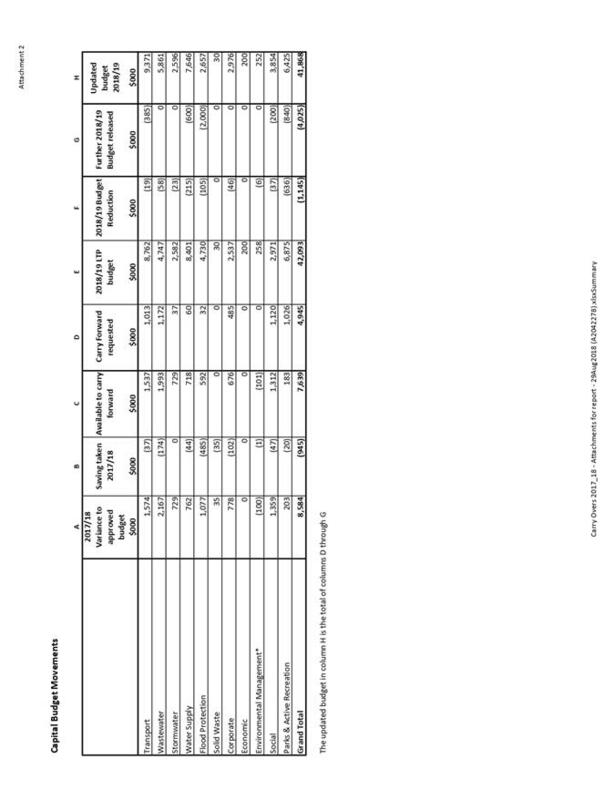 5.5 A breakdown of budget movements in capital budgets is provided as Attachment 2. 5.6 Attachment 1 itemises capital projects with carry overs requested greater than $100,000 along with budget identified for release. 5.7 Officers were asked to identify operating projects and programmes that will be completed in the new financial year and which require a carry- over of funds in order to do so. A total of $0.7 million has been requested. 5.9 Operating programmes/projects with carry overs requested greater than $50,000 are itemised in Attachment 1. 5.10 The sub-committee’s attention is drawn to the following two projects, namely Saltwater Creek Bridge and Queens Gardens Toilets that will require additional funding to ensure successful delivery. The reasons for this additional funding is briefly covered below for each item, but separate more detailed reports will be presented to the Works and Infrastructure and Community Services Committees respectively. 5.10.1 Saltwater Creek Bridge – Following closing of tenders and detailed evaluation, the overall budget has been exceeded. This project attracts Urban Cycleway Funding that needs to be spent by the end of June 2019. 5.10.2 Queens Gardens Toilets – Following the withdrawal of the contractor from this project and re-assessment of the estimate additional funding is required prior to the project having to be re-tendered this financial year. 6.1 Council officers recommend Option 1, approve the recommendations. Not approving the recommendations would be problematic as the future scope of some of these projects has been agreed through Committee and Council resolutions including Annual and Long Term Plans prior to this meeting. Work has continued on these projects based on those decisions. · Work has continued on 2017/18 capital projects and programmed operating projects and costs have been incurred. · The carry forward spending is within previously approved budgets. · Council could if they wished remove some items from the list of budgets to be carried forward. · Savings in future debt, depreciation, interest and maintenance costs would occur. · The projects concerned would then not have sufficient budget to be completed. · Council do not have complete information through this report to fully inform such a decision. · $5 million of capital budget not spent should be carried forward into 2018/19. 7.2 $0.7 million of programmed operating expenditure not spent should be carried forward into 2018/19 to progress or complete programmed work that has already been rated for. Approval of the recommendation will allow progress/completion of approved projects, supporting the delivery of public infrastructure and services. Approval of this recommendation will allow projects as approved in the Annual Plan 2017/18 and subsequent Council resolutions to be delivered. Failure to approve the recommendation will introduce risk (financial, contractor and community relationships, health and safety) which does not currently exist. There is little financial impact from approving the recommendation as budgets are already approved and funded. This matter is of low significance as budgets are already approved and the recommendation confirms business as usual. Therefore no engagement is required. The Audit, Risk and Finance Subcommittee has the following delegations to consider the 2017/18 Carry Forwards. 1.1 To seek approval for proposed changes to the Internal Audit Charter which will enhance its relevance whilst upholding compliance with international internal auditing standards. 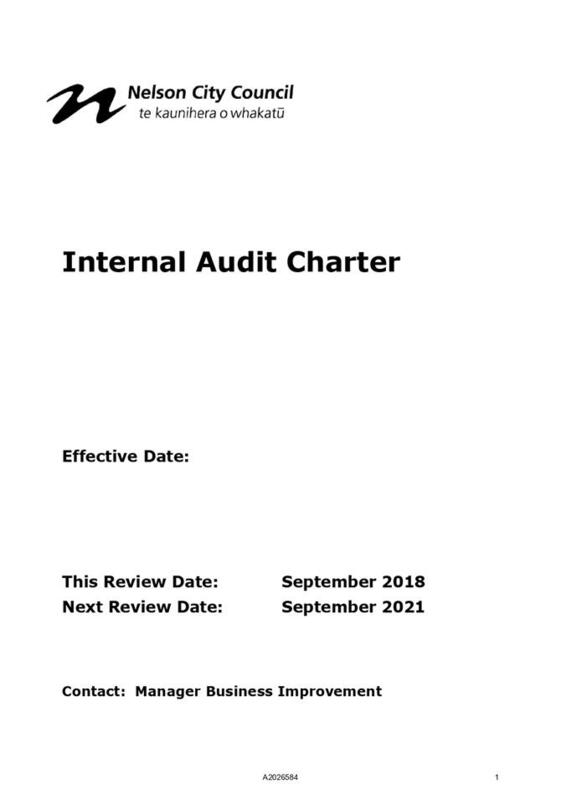 2.1 Under the International Standards for the Professional Practice of Internal Auditing (Standards) and Nelson City Council’s Internal Audit Charter, the Internal Audit Charter requires periodic review to ensure relevance. 2.2 Changes to the Charter must be considered by the Audit, Risk and Finance Subcommittee and approved by Council. 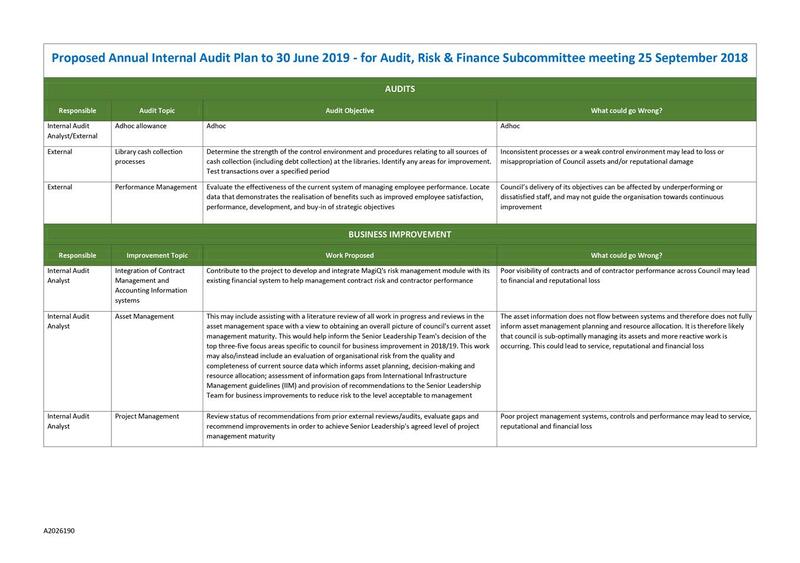 2.3 The proposed Internal Audit Plan to 30 June 2019, to be considered by the Audit, Risk and Finance Subcommittee on 27 September 2018, includes activities to be performed by internal audit that fall outside the internal audit function. 2.4 This additional role for internal audit is considered necessary to respond to the organisation’s current need to expedite business improvements particularly in areas considered high risk. 2.5 The blend of activities for internal audit has the potential to impair internal audit objectivity, unless carefully managed. 2.6 The attached proposed changes to the Charter are intended to address objectivity concerns, comply with Standards, and assist the organisation to make business improvements considered high priority. 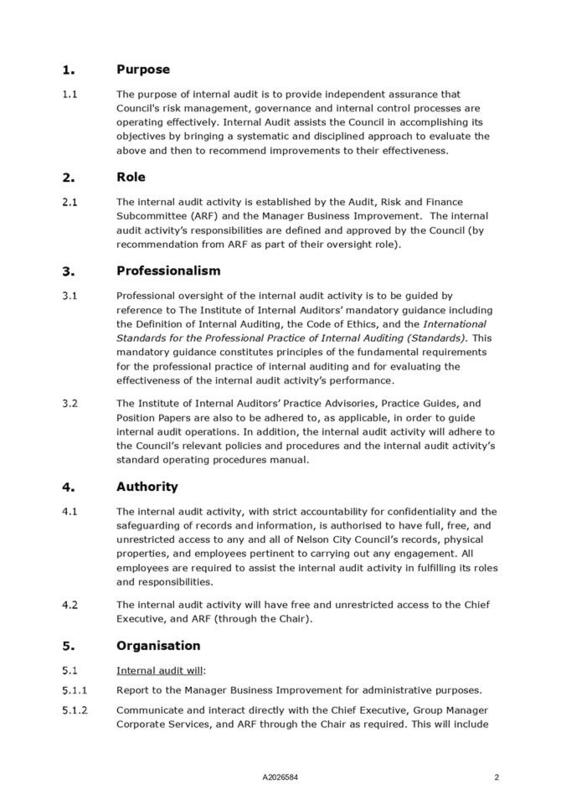 4.1 The Internal Audit Charter was approved by Council on 15 October 2015. There is a requirement under the Charter for periodic revision to ensure relevance. This is the first revision since establishment. 4.2 The International Standards for the Professional Practice of Internal Auditing (Standards) require that a review of an internal audit Charter should include any changes in roles or responsibilities that may affect the internal audit activity, particularly those that have the potential to impair objectivity, either in fact or appearance. 4.3 The proposed Internal Audit Plan to 30 June 2019 incorporates activities to be undertaken by internal audit that fall outside the area of internal audit. 4.4 The existing Internal Audit Charter states that any changes require consideration by the Audit, Risk and Finance Subcommittee and the approval of Council (by recommendation of the Governance Committee), after taking into account the recommendation of the Chief Executive. 5.1.1 The Introduction is now a Purpose Statement with a high-level description of how that purpose will be achieved. 5.1.2 The business unit Organisational Assurance no longer exists and is replaced with Business Improvement. 5.1.3 Reference to the Governance Committee in clause 4.2 has been removed. 5.2.1 Clause 5.1.1 now identifies that the reporting line to the business unit manager is for administrative purposes. This is to clarify that the relationship does not compromise independence. 5.2.2 Clause 5.1.2 now includes direct communication with the Chief Executive and Group Manager Corporate Services (as well as the Chair of Audit, Risk and Finance). This is to ensure matters of significant concern are promptly communicated to the highest level. 5.2.3 Clause 5.1.3 strengthens the notion that, for the internal audit to function for Council as intended, compliance with the international internal audit Code of Ethics is paramount. 5.2.4 New clauses have been added under section 5 (Organisation) which refer to the responsibilities of the Senior Leadership Team in relation to internal audit. Included is the provision of sufficient and timely resources to enable the achievement of any approved Annual Internal Audit Plan; and clarification of the overall responsibility for managing risks identified during internal audits. 6.1 Internal auditors must be objective in performing their work. For the first time since the internal audit function was established, the proposed Annual Internal Audit Plan to 30 June 2019 includes a blend of internal audit and business improvement activities. This is not expected to be a permanent arrangement but may raise objectivity concerns. The Chief Executive considers that in order to make real business improvement gains this arrangement should extend to 30 June 2020. 6.2 The Standards do not prohibit roles and responsibilities outside internal audit for internal auditors. 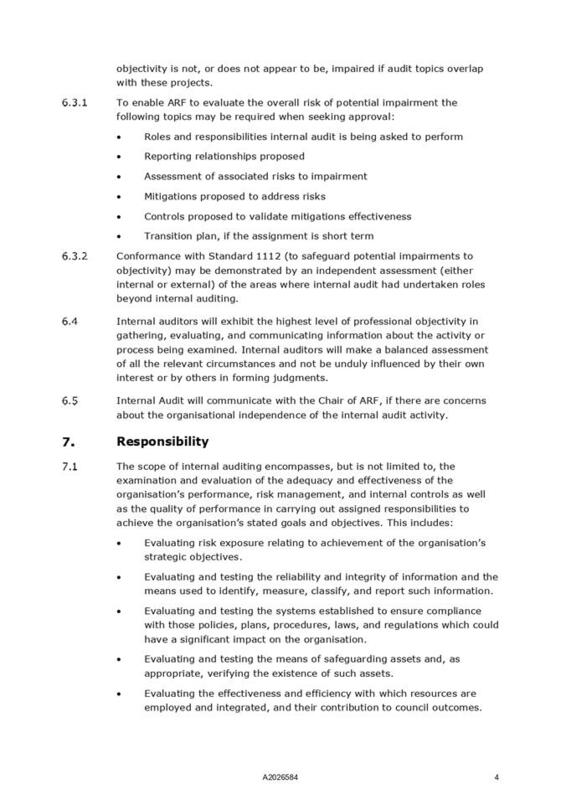 To counter possible objectivity impairment from this, there is a requirement (Standard 1112) that where these roles or responsibilities “may impair, or appear to impair, the organisational independence of the internal audit activity or individual objectivity of the internal auditor”, safeguards must be put in place. These include oversight activities, and may include such activities as “periodically evaluating reporting lines and responsibilities and developing alternative processes to obtain assurance related to the areas of additional responsibility”. 6.3.1 Clause 6.2 specifies that objectivity impairment occurs when an internal auditor performs an audit on an activity over which they had direct authority or responsibility within the previous 12 months (Standards guidance 1130.A1). 6.3.2 Clause 6.3 requires that work to be performed by internal audit that falls outside the internal audit function be pre-approved by Management and the Audit, Risk and Finance Subcommittee. 6.3.3 Clause 6.3.1 provides the level of detail that may be required in order for that approval to be properly considered. This includes a risk assessment, proposed mitigations, and a plan to transition from this type of work (Standards 1000, 1130). 6.3.4 Clause 6.3.2 provides the option to obtain an independent assessment of the areas where internal audit had undertaken roles outside internal auditing (Standard 1130.A2). 7.1 The preferred option is option 3 - that all proposed changes are accepted. · All internal audit resource can be allocated to performing internal audits. · The current Internal Audit Charter includes detail which is no longer accurate and it does not clearly identify responsibilities. This could limit the effectiveness of the internal audit activity. · The flow-on organisational impact from internal audits cannot be easily accommodated with current organisational resourcing levels. · Some critical process improvements will be delayed without the assistance available from internal audit. · Allows alignment to the organisation’s current business improvement needs and organisational capacity. · Provides Council with the flexibility to best utilise the skills available in the internal audit activity as business conditions change. · There may be instances where an urgent audit is required but internal audit skills are not available internally. · This risk is mitigated to an acceptable level in the Annual Audit Plan, with allowance for an adhoc audit. Further, careful selection of both planned internal audits, and of the business improvement areas proposed, ensure that known high risk areas are being attended to. This decision will help to ensure the resources available in internal audit contribute optimally to business improvement and internal auditing that will help give confidence that Council will be able to meet its responsibilities cost-effectively and efficiently. This report supports the community outcome that Council provides leadership, which includes the responsibility for protecting finances and assets, and to have an infrastructure which is efficient and cost effective. There is more risk that Council may not meet its responsibilities cost-effectively and efficiently if this recommendation is not accepted. There is no financial impact from this decision. This matter is of low significance because it does not affect the level of service provided by Council or the way in which services are delivered. Therefore no engagement has been undertaken. 1.1 To approve the Draft Annual Internal Audit Plan to 30 June 2019. 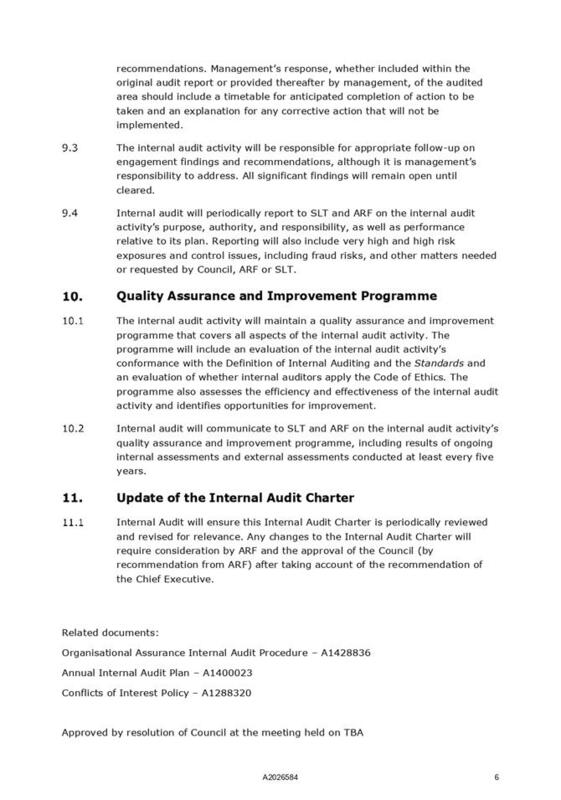 3.1 The Internal Audit Charter approved by Council on 15 October 2015 requires that at least annually, the Audit, Risk and Finance Subcommittee consider the Annual Internal Audit Plan. 3.2 The Internal Audit Charter cl. 8.2 requires the Internal Audit Plan to respond to changes in the business. 3.3 Historically, approval for the following year’s Draft Internal Audit Plan (Draft Plan) would have been sought prior to year-end. The Draft Plan for the year to 30 June 2019 has been delayed to allow Management to assess how to allocate the internal audit resource to provide most benefit to the organisation. This report reflects Management’s decision. 4.1 The Draft Plan (Attachment 1) was compiled following discussions with the Chief Executive, Group Manager Corporate Services, Manager Business Improvement, Chair of Audit, Risk and Finance and information provided by Audit NZ. Council’s Top 10 risks, together with the accompanying discussion at the 14 August Audit, Risk and Finance Subcommittee meeting, have also been considered. 4.2 Due to the organisation’s current business improvement needs and stretched capacity throughout, the Draft Plan incorporates a combination of internal audits and business improvement activities. The Chief Executive considers that currently this is the best use of the internal audit resource. 4.3 This blending of internal audit and business improvement is not intended to be permanent, however in order to make real business improvement gains the Chief Executive is of the view that this arrangement should extend to 30 June 2020. 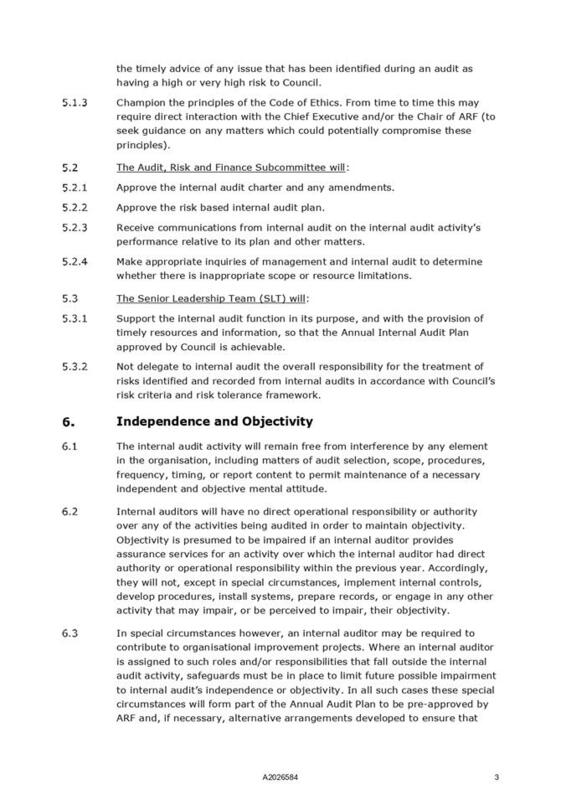 4.4 Council approval for internal audit to have responsibilities outside the internal audit function which do not compromise objectivity is being sought contemporaneously through the Draft Internal Audit Charter. 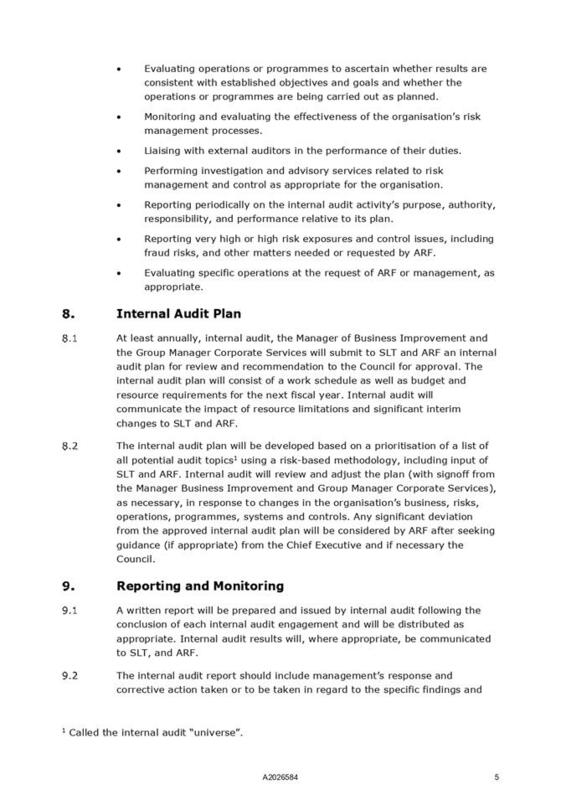 4.5 Council was made aware that the flow-on impact from internal audits places an additional burden on management staff and therefore a high-volume internal audit programme was unsustainable. A much-reduced Internal Audit Plan for the year to 30 June 2018 was approved at the Council meeting of 9 November 2017. 4.6 The Chief Executive has confirmed that the availability of staff to respond to internal audits and their outcomes remains limited. Alongside this, Council has a stated key goal in the Long Term Plan 2018-28 to lift Council performance. 4.7 The Internal Audit Charter clause 8.2 requires the Internal Audit Plan to respond to changes in the business. 4.8 The Chief Executive believes that the best use of internal audit for this and next financial year is to place some focus on business improvements which will contribute to the achievement of the goal to lift Council performance. The key activities for internal audit in this year’s plan therefore primarily relate to business improvement, while proposed internal audits have been allocated to contractors. 4.9 This proposal will not require additional budget this financial year. 4.10 The Draft Plan allows for one unexpected audit and two pre-determined audits (one of which to focus on opportunities for the misappropriation of Council’s assets). 4.11 Audit NZ have flagged the delivery of projects and contract performance as an issue for Council. We believe this has been (or will be) to some extent covered by the management and monitoring of contractor performance audit performed late in the 2017/18 financial year; the review of project management in 2014; and the recently announced review to be commissioned for the Greenmeadows project. There is undoubtedly business improvement required in this area and a review is required to determine the status of recommendations from both the 2014 review and from Audit NZ. This has been included in the business improvement section. 4.12 The selection of audit topic to assess the opportunities for the misappropriation of Council’s assets was supported by online data provided by the Office of the Auditor General (last updated 23 July 2018) relating to such incidents reported for 2017/18. Note: these incidents were discovered through internal tip-offs (2), external (2) tip-offs (neither through whistle blower systems available), internal controls (7) or internal audit (2). 4.13 The Chief Executive considers that there are key business improvement projects to help lift Council performance which internal audit could contribute to. These include the development and alignment of a new contract management database to the accounting information system, improvements to asset management systems and processes, and an assessment of the status of project management improvements. Time has been provided for these in the Draft Plan. 5.1 Options provided are to proceed with a level of internal audits based on previous Plans, or for internal audit to concentrate on contributing to business improvements. A reasonable level of internal audits will be performed in this second option through the use of contractors. 5.2 Option 1, which proposes a higher level of audits, is not favoured. This will overwhelm the organisation and resources will be diluted, compromising delivery of the most critical improvements. 5.3 The preferred option is Option 2. There are known improvement areas to lift Council performance which require significant effort and the organisation currently has limited resource for this work. 5.4 The combination of performing a small number of audits to give the Audit, Risk and Finance Subcommittee reasonable confidence that important controls are performing as intended, and of contributing to business improvement, is considered the most valuable use of the internal audit resource. Further, the likelihood of an audit in which the objectivity of internal audit may be compromised is low and mitigations have been addressed in the Draft Internal Audit Charter. The arrangement proposed is for a relatively short period. · Council will have a greater knowledge of areas across the organisation where there have been systems or control failures. · A higher volume of internal audits impacts on the organisation, taking scarce resources away from performing other key responsibilities, which may have higher consequences to the organisation than those of the risks found from an audit. · While control weaknesses are likely to be identified from an internal audit, the ability to treat these is limited due to scarce resources. · The effort required to make business improvements that address these areas for improvement is significant, and the impact of additional audits would take resources available across the organisation away from these key improvement areas. · Remedying some of the already known weaknesses as soon as practicable is in Council’s best interests. · The primary goal of business improvement is to increase effectiveness and efficiency to improve the organisation’s ability to deliver services. A good improvement plan will focus on the organisation’s most important activities and any associated risks, and will address any necessary mitigations. This is closely aligned to the internal audit process but is forward-looking, while internal audit informs past performance. · There may be future costs where external audits are required in areas where internal audit has had some responsibility or involvement in the previous 12 months. It is more likely that Council may not meet its responsibilities cost-effectively and efficiently if this recommendation is not accepted. This decision will fit within existing budgets. The Audit, Risk and Finance Subcommittee has the delegation to consider the Annual Internal Audit Plan and the resourcing for this each year.